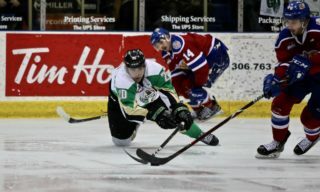 RAIDER REVIEW: The Raiders (45-7-0-2) head to Swift Current tonight to take on the Broncos (10-38-2-2) at the Innovation Credit Union i-Plex. 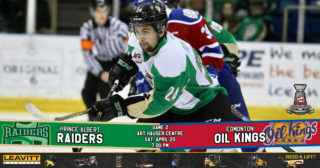 On Saturday night, the Raiders edged the Lethbridge Hurricanes 6-5 at the ENMAX Centre. Cole Fonstad led the way with two goals, including the game winner with 6:37 to play in the third period. Parker Kelly had a goal and an assist, while Noah Gregor and Max Martin chipped in two assists each. Sean Montgomery, Eric Pearce, and Ozzy Wiesblatt also scored for the Raiders in the win. Boston Bilous picked up the win with a 29-save effort. VS. 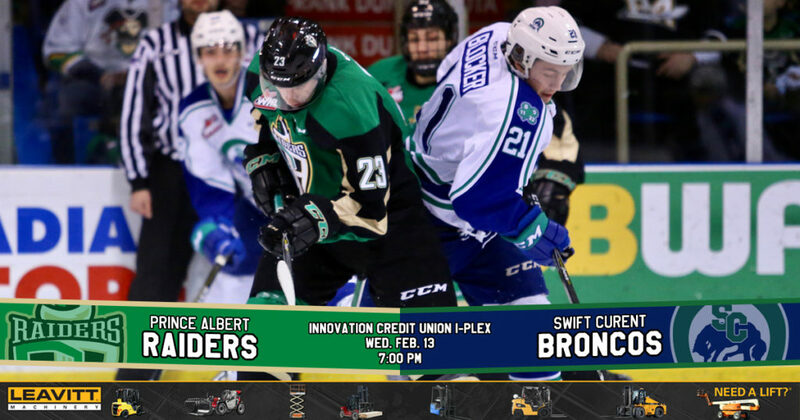 SWIFT CURRENT: This is the fourth meeting of the year between the Raiders and the Broncos. The Raiders won the last meeting 7-5 on Dec. 15. So far this season, the teams have split the two games played in Swift Current. PLAYER OF THE WEEK: Cole Fonstad was named the WHL On The Run Player of the Week for the week ending February 10 on Monday. The Montreal Canadiens prospect had five goals and three assists in three games played during the week, including a career-high five-point night in Calgary on Friday. He is currently riding a five-game goal and point streak, including three multi-goal games. His current goal streak is the longest of his WHL career. Fonstad is third on the team in scoring with 26 goals and 34 assists on the season. 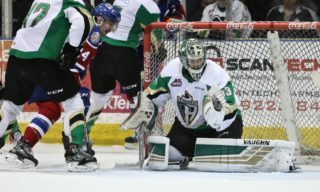 BACK TO BACK: Eric Pearce’s goal against Lethbridge on Saturday was his second in as many nights after snapping a 19-game drought. It is the first time in his WHL career that Pearce recorded goals in back-to-back contests. POWER PLAY: The Raiders scored a power-play goal for the third consecutive game on Saturday night, tallying five goals on 12 attempts during their Central Division swing. 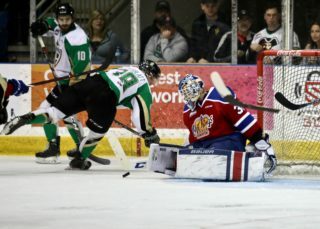 This is the first time the Raiders have scored power-play goals in three straight games since a stretch of games from Jan. 1 to 5 against Regina, Moose Jaw, and Saskatoon. 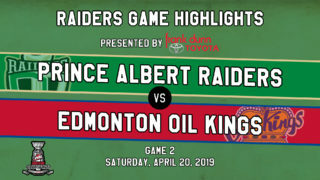 NEXT UP: The Raiders are back at home on Friday night and will be sporting throwback sweaters when the Brandon Wheat Kings come to the Art Hauser Centre for a 7 p.m. start. The sweaters will be available via live auction following the game in the Ches Leach Lounge with Schmalz Auctions. Get tickets at raiderhockey.com and the Raider Office.